At the recent World Health Summit in Berlin, there was a noticeable lack of discussion on the role of the natural environment in health. Co-benefits to human health from ecosystem protection, biodiversity, or urban greening were mentioned far less frequently than the impacts of the socioeconomic environment. This suggests that the global health community is not yet fully engaged with the field of planetary health. Initiatives such as the Lancet Commission on Global Health and Climate Change, recent work by The Lancet on the synergies between universal health coverage, health security and health promotion calling for more coordination in the global health landscape, and the forthcoming EAT-Lancet Commission report on Healthy Diets from Sustainable Food, all offer a good starting point to address fragmentation. However, they do not go far enough. Human and planetary health should not be viewed as two sides of the same (environmental) coin. Instead, global health and environmental science need to be on the same side if we are to find truly innovative solutions rather than simply manage trade-offs. The term “planetary health” was first presented in a Rockefeller-Lancet Commission report. Its proponents and funders come from the fields of public and global health, but its conceptual underpinning comes from environmental science – the planetary boundaries and the Great Acceleration of earth system change. Instinctively, we know that reducing carbon emissions, using fewer artificial fertilizers and protecting ocean marine stocks will in the long-term benefit the health of people as well as the planet. 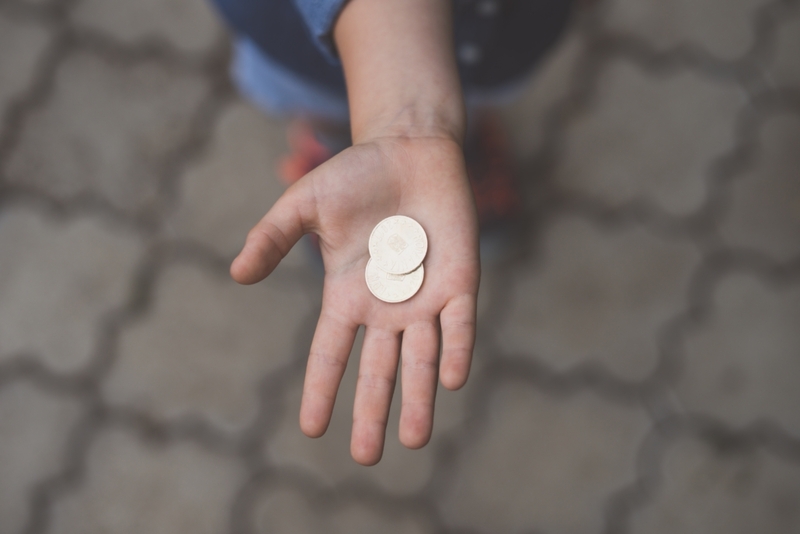 These benefits, however, are difficult to frame through the lens of the Global Burden of Disease (GBD), which encourages an emphasis on the value of the short term and quick wins of treatment over the longer-term investment needed for prevention. By focussing on the symptoms in humans, we stop short of following the causal chain far enough back to find its true root, and miss an opportunity to heal the planet as well. A truly interdisciplinary approach would go deeper into understanding the problem and look more widely to develop solutions. 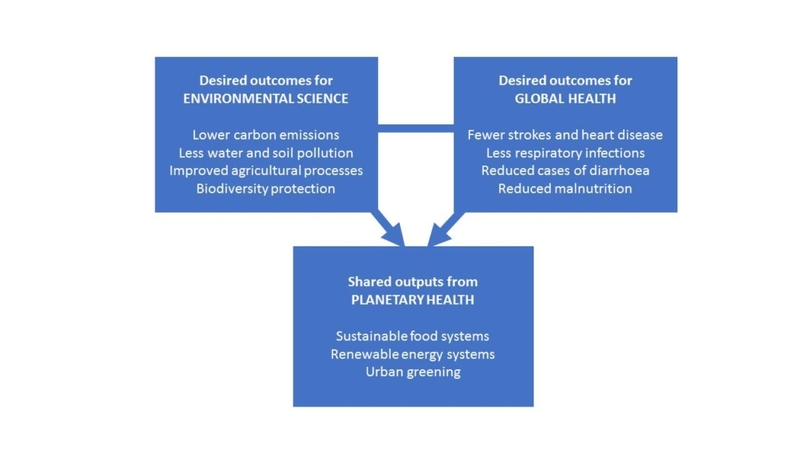 Planetary health can produce shared outputs that deliver the desired outcomes of both global health and environmental science. One way to bring the two fields fully together is to focus less on the conditions that top the GBD today, and instead project what the burden might be under a range of future climate change scenarios; this may particularly help to support those in the global health community who are acknowledging the risks from climate change and calling for action. This will better enable global health practitioners, academics and policy-makers to visualise and value a long-term approach in which environmental factors are fully integrated. For this to occur, the blinkered call for only new diagnostics and drugs to tackle antimicrobial resistance must give way to a more holistic approach that integrates not only better stewardship, but also improved livestock and agriculture practices, transformed food systems, and support for improved sanitation which, in turn, can support cleaner energy initiatives. Second, until the impacts of climate change are more keenly felt by global health professionals, the costs of reducing them will be borne solely by environmental budgets. New economic models that fully capture the externalities of the energy and food systems, and their subsequent impacts on health, will help to drive investment and ensure that this investment is distributed more broadly. However, while the costs are felt acutely, the benefits are diffuse, which means that success risks a dilemma – if we get it right, no one may notice the effort. This makes it imperative that all stakeholders are fully engaged from the beginning, that the co-benefits of collaboration are scoped, and their rewards recorded and clearly communicated. Third, global health – a field heavily influenced by medical practitioners – often finds the language implicit in the planetary health discussion overly sensationalist and existentialist. While the challenges in planetary health are certainly alarming, planetary health professionals would be wise to think through how they can best deliver their message in an inviting, not alienating, manner. Finally, we need to consider how and where the best discussions should take place. In the short term, there may be more value in environmentalists presenting at future World Health Summits than vice versa. We need to draw attention away from global health’s focus on short-term health wins towards the larger and longer-term issues of better environmental stewardship, reform of food systems, and the development of new and more sustainable sources of energy. Global health needs to see the planet, and not just its inhabitants, as our patient. By Jennifer Cole, Public Health Policy Advisor, Secretariat of the Rockefeller Economic Council on Planetary Health, University of Oxford; Connor Rochford, Blavatnik School of Government, University of Oxford; and Esther Schroeder, Worcester College, University of Oxford.